Now, Amazon Too Starts Offering Domain Registration Services! Amazon is at it again, a month after Google announced their Domain name registration service offerings, Amazon too has gone ahead and announced the same. You can now register new domain names as well as transfer from your existing registrars to Amazon through their Route 53 Domain Name Services. If you are an existing Amazon user of one of their services like EC2, S3 or others, you know that till now you had to first register your domain at an external registrar, create the Hosted Zone in Route 53, and then configure your domain’s entry at the registrar to point to the Route 53 name servers. With launch of new Route 53 Domain Name Registration, you can now take care of the entire process from within the AWS Management Console. You can buy, manage, and transfer (both in and out) domains from a wide selection of generic and country-specific top-level domains (TLDs). As part of the service Amazon. As far as the pricing of Domain names go, they are nearly equal to what most of the popular registrars offer. The .com TLD is priced at $12 for a year, whereas prices for other TLDs vary starting from USD $9 p.a. For Amazon, this was a logical move, and surprisingly they have launched it quite late, probably spurred on by launch of “Google Domains”. Through Route 53 they already offered domain name management services, but with this launch they are now a end-to-end domain service provider. Amazon’s domain services do come with few added features that including configurable expiration notification and optional auto-renewal, health checks etc. for your web applications. Standard Queries – $0.40 per million queries for the first billion queries per month; $0.20 per million queries after that. LBR Queries – $0.60 per million queries for the first billion queries per month; $0.30 per million queries after that. Geo DNS Queries – $0.70 per million queries for the first billion queries per month; $0.35 per million queries after that. While the prices may not affect too much for small users, it will definitely make a difference to users who have large websites and applications running on Amazon. 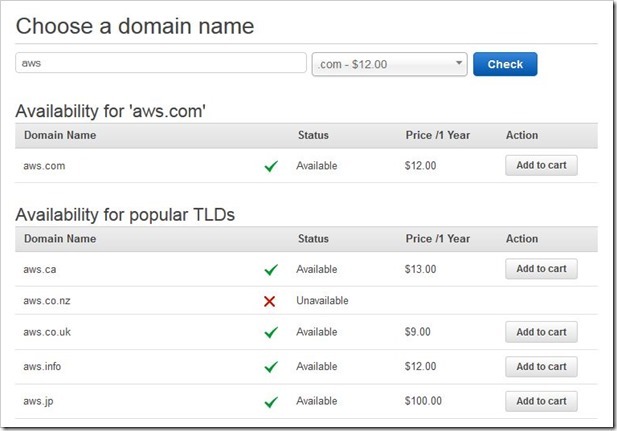 "Now, Amazon Too Starts Offering Domain Registration Services! ", 5 out of 5 based on 1 ratings. Seems useless. Who would pay 10 times the amount just to get registered by a well known brand? There are many registrars that give away domains at $1 and $2. What say?